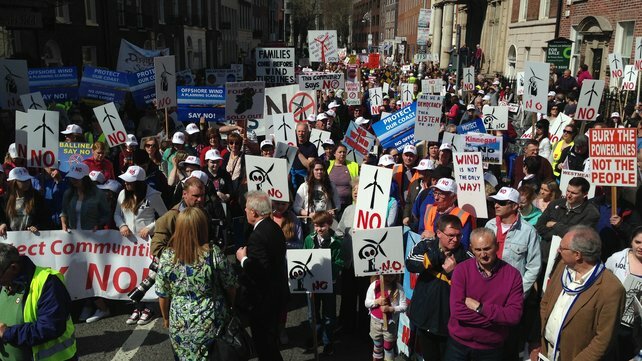 Up to 5,000 people are taking part in a protest in Dublin city centre against the Government’s wind energy and pylons policy. The march, which is began around now at the Garden of Remembrance, was due to end outside Leinster House. The march is organised by Wind Aware Ireland, a new group combined of organisations against pylons and overhead power cables and those opposed to wind farms. With increasing alarm over climate change in recent weeks, Ireland’s energy policy is under scrutiny like never before. Also, with local elections around the corner the matter is of acute political significance in many parts of the country. News this week that a wind energy export deal with Britain was off the table, has done little to reduce concerns. Environmental campaigners are meanwhile calling for the Government to encourage communities to take ownership of future wind energy plans. Meanwhile, the Government has set a tentative date of later this year for publishing its Climate Bill.